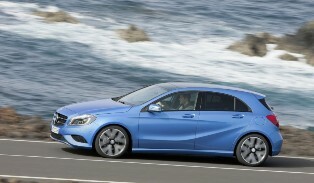 German automotive giant Mercedes-Benz has unveiled their new, third generation of the bubbly A-Class model. Coming in with fiber-optic cables and LED modules on its rear taillights, you get one of the coolest compact models around. Designed for the younger drivers, Mercedes-Benz surely have drawn their experience and inspiration from its previous generations and put the best into this one. The car can be paired with an iPhone app and will be made to run on either petrol or diesel. It will come in the form of the A180 which is powered up with a 1.6 liter engine boosting out 115 horses while the A200 comes with a 156 horsepower 2.0 liter engine and the top of the range would be the A250 model that comes with a 2.0 liter engine that pushes out 211 horses. The 1.6 model comes with the CAMTRONIC system which is the first model to be fitted with this revolutionary technology. According to Mercedes, the new A-Class emits only 99g of CO2 per kilometre which is also another first. Diesel choices also come in threes which are the A180CDI, A220CDI and the A200CDI which are mated with either the 6 speed manual transmission gearbox or the 7G-DCT dual-clutch automatic transmission gearbox. The cool and totally revolutionary 4MATIC AWD system is also included. Apart from the long list of acronyms, they also provided the radar-controlled Collision Prevention Assist in this one.